Digital painting tutorial Gnoll Hyena commandos. This tutorial show you how to paint key concept scene of a pack of hyena super commandos with huge machine guns in mecha armor design concept art. You can scroll down further to see step by step images with instruction. I spend about 30 minutes to finish up the speedpainting or composition of the first Hyena, the scared face. The speedpainting is basically a quick concept art to give you overall idea. But then I thought, hyena usually travel in pack so I give him a gang or a troop. Usually I will get one good one out of three to five speedpaints and spend more hours to polish it up like many of my recent concept art. I like the creature design and the lighting in the original for this one so I picked it. In this tutorial, I also use back lighting on the creature and a little over head from the right side of the screen. Back lighting means you will see the figures or object mostly in shadow. There can possibly be rim light along the edge of the subject. It mostly come from one side, but in this one it comes on both sides of the subject. You will see all the hyenas in shadow because they are all back lid. But the shadow have value range that is light enough do you can still see some detail in them. I first painting the creature and the figure with just shapes and silhouettes. Shapes are really important in painting. If you can get these big bold shapes correct, you are more than half way done. As long as you shape contains realistic essence of the subject, it can look very realistic and dramatic lighting will help elevate your painting to another level without much effort. 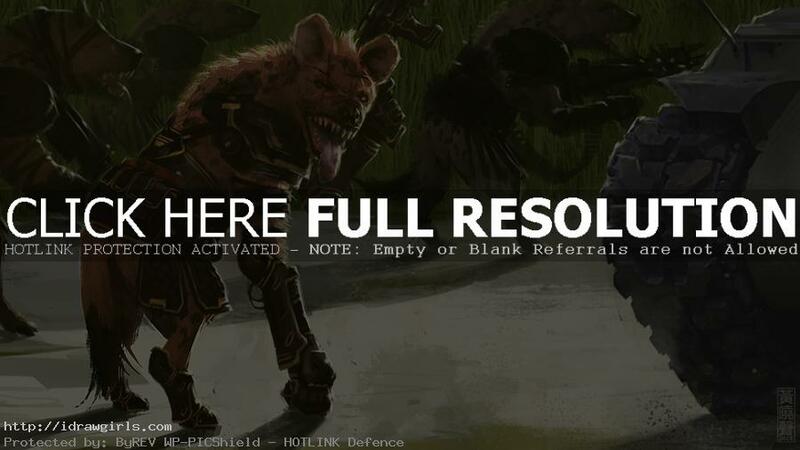 Below are step by step image how to paint Gnoll commandos concept art. –Concept art tutorial creature in ancient ruins.